LG Display's 900 million E5 line in Gumi is scheduled to start producing flexible AMOLED soon, and according to the Korea Herald LG aims to adopt flexible OLEDs in its upcoming V30 smartphone (due out in September) and also in the 2018 G7 phone. The Korea Herald says that LG aims to start adopting OLEDs in all its future smartphones - although it is likely that the Korean maker will only use OLEDs in premium phones (especially as it is only producing high-end flexible OLEDs rather than glass based ones). 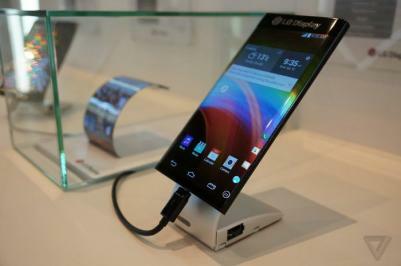 LGD will also reportedly devote some of its capacity to Chinese phone makers. Besides the E5 line and its existing low-volume pilot line, LG is also working on a third flexible OLED fab, the E6 line, which will also be a 6-Gen fab with double the capacity of the E5 line (15,000 substrates). The E6 is scheduled for the end of 2018. LGD's ambitious P10 OLED fab will also include some flexible OLED capacity - although plans for this fab hasn't been finalized yet, and it will mostly be used to make large area OLED TV panels. LG did not use OLED displays in its smartphones since the Flex 2, launched in January 2015. In the past years LG devoted all of its (limited) flexible OLED capacity to wearable displays (mostly Apple's Watch).